Look Within – You Are The World! I think there is a way of understanding the whole process of birth and death, becoming and decaying, sorrow and happiness…. we see around us this continual becoming and decaying, this agony and transient pleasure, but we cannot possibly understand this process outside of ourselves. We can comprehend this only in our own consciousness, through our own ”I” process and if we do this, then there is a possibility of perceiving the significance of all existence. Is there a reason for being? Why do you want a reason forbeing? (Laughter). You are here. And because you are here and don’t understand yourself, you want to invent a reason. You know, Sir, when you look at a tree or the clouds, the light on the water, when you know what it means to love, you will require no reason for being….. Then all the museums in the world and all the concerts will have only secondary importance. Beauty is there for you to see, if you have the mind and the heart to look-not out there in the cloud, in the tree, in the water, in the thing, but in yourself. What is important is not to follow anybody but to understand oneself. If you go into yourself without effort, fear, without any sense of restraint, and really delve deeply, you will find extraordinary things; and you don’t have to read a single book…. 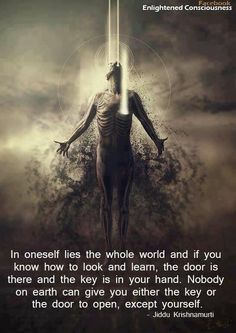 In oneself lies the whole world, and if you know how to look and learn, then the door is there and the key is in your hand. Nobody on earth can give you either that key or the door to open, except yourself.